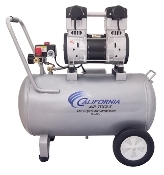 The CALIFORNIA AIR TOOLS 15020C-22060 Ultra Quiet & Oil-Free Air Compressor is designed to be one of the quietest 2.0 Hp air compressors in the industry having only 70 decibels of sound. The Powerful "New" 2.0 HP - 220 Volt 60 Hertz (SP-9421-22060) motor operates at only 1680 RPM creating less noise and less wear. The CAT-15020C-22060 Air Compressor has a Oil-Free Dual Piston pump designed to have a life cycle before wear of 3000 Plus hours compared to other comparable air compressors with life cycles of 500 hours or less.